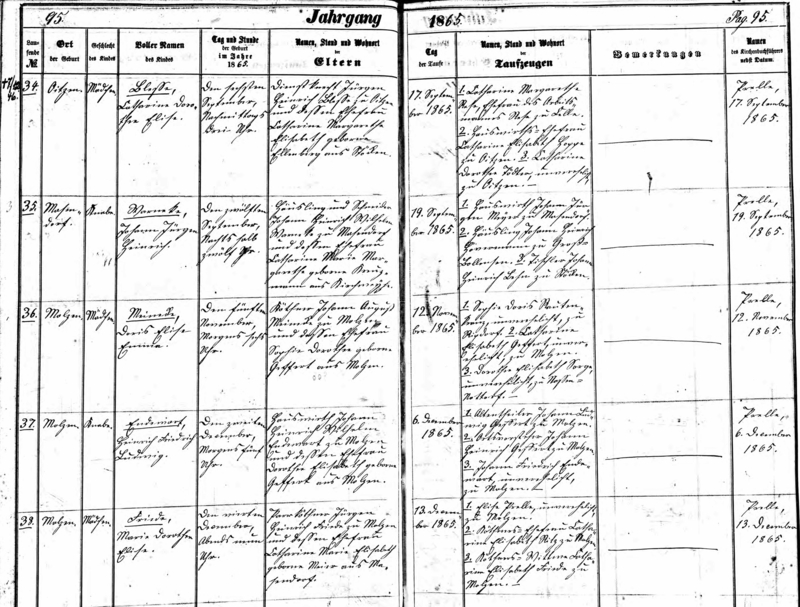 Marie Dorothee Elise Friede was born on 4 December 1865 at Molzen, Uelzen, Hanover, Germany. She was the daughter of Jurgen Heinrich Friede and Catharine Marie Elisabeth Meier Of Masendorf. She died on 25 February 1866 at Molzen, Uelzen, Hanover, Germany. [S407] Lutheran Church, German Lutheran Church Records 1500-1971, Page 95;95. Film number 470788. [S392] Lutheran Church, German Lutheran Church Records 1875-1940, Page Number: 77;77. 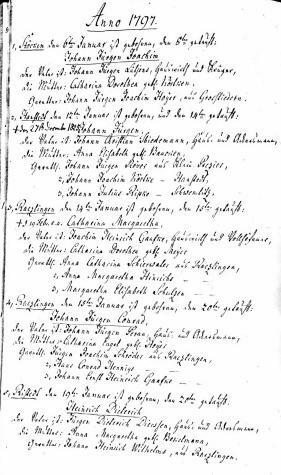 Hans Jürgen Friede was born in March 1749 at twin with Dorothea Catharine, Molzen, Uelzen, Hanover, Germany. He was the son of Johann Jürgen Friede and Anna Catharina Schultzen. [S407] Lutheran Church, German Lutheran Church Records 1500-1971, Film number 470782. Name Variation Dorothea Catharine Friede was also known as Frieden. Name Variation Dorothea Catharine Friede was also known as Dorothee Catharine. 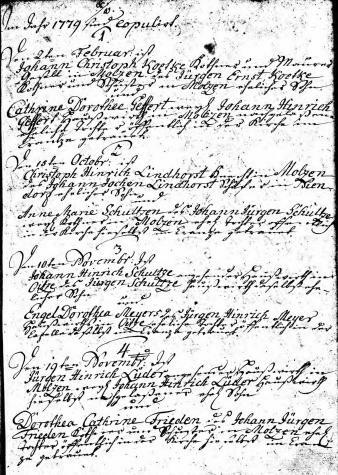 Married Name 19 November 1779 As of 19 November 1779,her married name was Lüders. Dorothea Catharine Friede was born in March 1749 at twin with Hans Jürgen, Molzen, Uelzen, Hanover, Germany. She was the daughter of Johann Jürgen Friede and Anna Catharina Schultzen. [S407] Lutheran Church, German Lutheran Church Records 1500-1971, Image 187 of 525: Hannover Molzen Taufen, Heiraten, Tote u Konfirm 1733-1852. Name Variation Johann Ernst Fauteck was also known as Johann Heinrich. Name Variation Johann Ernst Fauteck was also known as Vautek. Name Variation Johann Ernst Fauteck was also known as Veutek. Johann Ernst Fauteck was born circa 1729 at Hanover, Germany. He married Dorothea Maria Müller before 1761. [S407] Lutheran Church, German Lutheran Church Records 1500-1971, Film number 473867. [S407] Lutheran Church, German Lutheran Church Records 1500-1971, Page 121;122. Film number 473867. [S407] Lutheran Church, German Lutheran Church Records 1500-1971, Film Number: 473867. Married Name 30 October 1881 As of 30 October 1881,her married name was Friede. Catharine Dorothee Elisabeth Meÿer was born at Germany. Name Variation Heinrich Diederich Dierssen was also known as Heinrich Dietrich. [S407] Lutheran Church, German Lutheran Church Records 1500-1971, Page 16;16. Film number 473840. [S407] Lutheran Church, German Lutheran Church Records 1500-1971, Hannover Rätzlingen Taufen, Heiraten, Tote u Konfirmationen 1761-1832. Image 16 of 457. Johann Gottfried Graeske married Wilhelmine Hellmuth. Married Name Her married name was Graeske. Wilhelmine Hellmuth married Johann Gottfried Graeske. Jürgen Friderich Scheessel was born at Germany. He married Engel Elisabeth Cohrs. Married Name Her married name was Scheessel. Engel Elisabeth Cohrs married Jürgen Friderich Scheessel. Engel Elisabeth Cohrs was born at Germany. Jürgen Hinrich Scheessel was born on 31 December 1804 at Hanover, Germany. He was the son of Johann Jürgen Scheessel and Catharina Dorothea Friede. Name Variation Johann Hinrich Scheessel was also known as Scheeßel. Johann Hinrich Scheessel was born on 21 November 1800 at Hanover, Germany. Johann Jürgen Scheessel was baptized on 1 February 1807 at Evangelische Kirche, Molzen, Hanover, Germany. He was born on 1 February 1807 at Hanover, Germany. Married Name 28 September 1834 As of 28 September 1834,her married name was Scheessel. Name Variation Anne Catharine Behn was also known as Meyer. 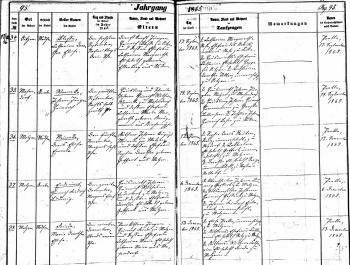 Married Name 6 August 1820 As of 6 August 1820,her married name was Dierssen. Anne Catharine Behn was born in 1793 at Germany. She was the daughter of Carl Behn and Catharine Margarethe Meyers. [S407] Lutheran Church, German Lutheran Church Records 1500-1971, Page 6;6. Film number 473840. August Friedrich Schütte was born at Germany. He married Catharine Margarethe Endewart. Married Name Her married name was Schütte. Catharine Margarethe Endewart married August Friedrich Schütte. Catharine Margarethe Endewart was born at Germany. Name Variation Johann Friedrich Wilhelm Dierssen was also known as Dierßen. Johann Friedrich Wilhelm Dierssen was born on 31 October 1848 at Hanover, Germany. He was the son of Johann Jürgen Dierssen and Catharine Marie Dorothee Elisabeth Schütte. Johann Friedrich Wilhelm Dierssen was baptized on 3 November 1848 at Evangelische Kirche, Molzen, Hanover, Germany. He died on 13 December 1865 at Hanover, Germany, at age 17. He was buried on 16 December 1865 at Evangelische Kirche, Molzen, Hanover, Germany. Name Variation Friedrich August Dierssen was also known as Dierßen. Friedrich August Dierssen was born on 6 December 1851 at Hanover, Germany. He was baptized on 7 December 1851 at Evangelische Kirche, Molzen, Hanover, Germany. Name Variation Dorothee Elisabeth Dierssen was also known as Dierßen. Dorothee Elisabeth Dierssen was born circa 1842 at Hanover, Germany. She was the daughter of Johann Jürgen Dierssen and Catharine Marie Dorothee Elisabeth Schütte. Dorothee Elisabeth Dierssen died on 8 May 1843 at Hanover, Germany. She was buried on 11 May 1843 at Evangelische Kirche, Molzen, Hanover, Germany. Name Variation Heinrich Friedrich Dierssen was also known as Dierßen. Heinrich Friedrich Dierssen was born on 8 March 1844 at Hanover, Germany. Heinrich Friedrich Dierssen was baptized on 10 March 1844 at Evangelische Kirche, Molzen, Hanover, Germany. He married Catharine Sophie Maria Schulz in 1872 at Evangelische Kirche Sankt Marien, Ülzen, Hanover, Germany. Married Name 1872 As of 1872,her married name was Dierssen. Catharine Sophie Maria Schulz was born on 8 May 1842 at Germany. She married Heinrich Friedrich Dierssen, son of Johann Jürgen Dierssen and Catharine Marie Dorothee Elisabeth Schütte, in 1872 at Evangelische Kirche Sankt Marien, Ülzen, Hanover, Germany. 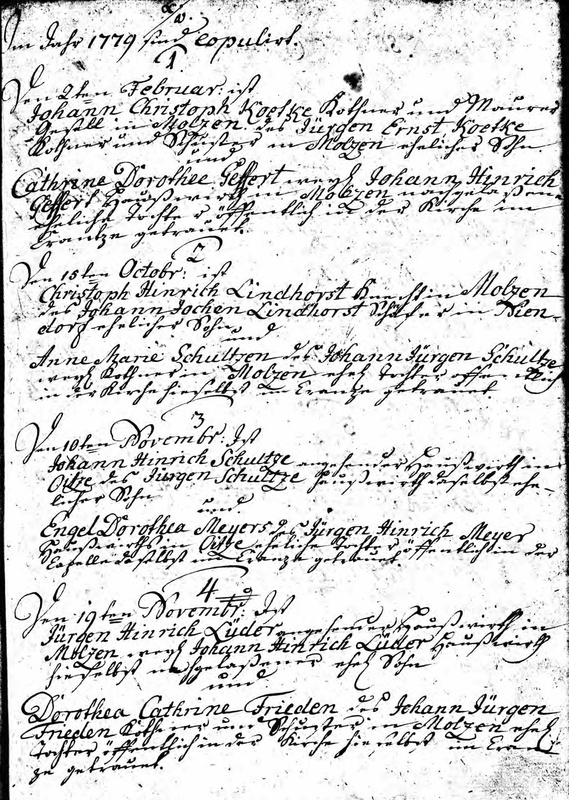 Jürgen Heinrich Meyer married Catharine Dorothee Elisabeth Sander. Jürgen Heinrich Meyer was born on 27 April 1823 at Hanover, Germany. He was the son of Jürgen Heinrich Meyer and Catharine Elizabeth Dierssen. Jürgen Heinrich Meyer died on 30 September 1860 at Hanover, Germany, at age 37. He was buried on 3 October 1860 at Evangelische Kirche, Molzen, Hanover, Germany. Catharine Dorothee Elisabeth Sander married Jürgen Heinrich Meyer, son of Jürgen Heinrich Meyer and Catharine Elizabeth Dierssen. Johann Friedrich Meyer was born on 22 July 1835 at Hanover, Germany. Catharine Dorothee Elisabeth Meyer was born on 22 April 1830 at Hanover, Germany. She was the daughter of Jürgen Heinrich Meyer and Catharine Elizabeth Dierssen. Johann Jürgen Christoph Meyer was born on 23 July 1825 at Hanover, Germany. Johann Jürgen Christoph Meyer married Catharine Margarethe Birkens in 1861 at Evangelische Kirche, Molzen, Hanover, Germany. Johann Jürgen Christoph Meyer died on 10 February 1907 at Hanover, Germany, at age 81. Married Name 1861 As of 1861,her married name was Meyer. Catharine Margarethe Birkens was born on 6 March 1837 at Germany. She married Johann Jürgen Christoph Meyer, son of Jürgen Heinrich Meyer and Catharine Elizabeth Dierssen, in 1861 at Evangelische Kirche, Molzen, Hanover, Germany.